By rights, Moon Mullican should be a legend twice over, in country music and rock & roll. He merged them both -- as well as blues, pop, and honky tonk -- into a seamless whole at the drop of a hat and the ripple of a keyboard, and also managed to play a seminal role in the history of Western swing, all in a recording career that lasted less than 30 years. Instead, for decades he was one of those "lost" musical figures from the '40s and early '50s, whose career paved the way for rock & roll, who was born just a little too early and was a little too old to take advantage of what he'd started. Aubrey "Moon" Mullican was born in 1909 in Corrigan, TX, a little more than an hour's drive north of Houston, to a family that owned an 87-acre farm that was worked (at least partly) by sharecroppers. It was one of them, a black blues guitarist named Joe Jones, who introduced Mullican to the blues before he was in his teens. Mullican's instrument of choice, however, was the keyboard: first the family organ, which had been bought so that his sisters could practice playing hymns, and later the piano. By the time he was 14, he was able to make 40 dollars -- a good deal more than a day's wages in 1923 -- for two hours of piano playing at a local cafй. Music was not only something he loved, but it offered a lot more renumeration than farming (or even overseeing land worked by tenant farmers) seemed to; it was also something that his father, a three-time-a-week churchgoer who regarded blues as the devil's music and the places where people listened to it as the devil's playground, despised. Thus at 16, Mullican left home for the big city of Houston. He made his living playing music and earned the nickname "Moon," which stuck for the rest of his life. 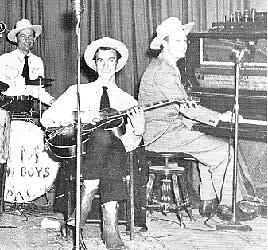 During the mid-'30s, he joined the Western swing band the Blue Ridge Playboys, and moved from there to playing in Cliff Bruner's Texas Wanderers, as well as recording with the Sunshine Boys and Jimmie Davis. 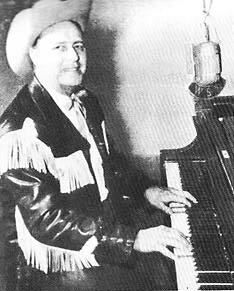 Mullican's talents at the ivories were long established by the end of the '30s -- he played the piano like it was a part of him -- but he moved to the lead singer's spot in 1939 when Bruner recorded the pioneering country trucker song, "Truck Driver's Blues." He turned out to be every bit as good a singer as he was a pianist, with a stunningly expressive voice even if it didn't have an overly great range. 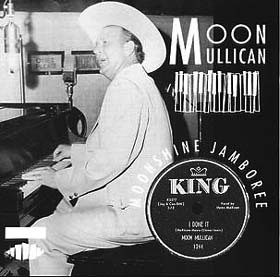 This recording and the advent of the '40s heralded the busiest phase of Mullican's career, as he juggled a long-term association with Bruner, a stint in the backing band for Jimmie Davis during the latter's successful campaign for governor of Louisiana, and recording dozens of sides for Decca, RCA Victor, and Columbia Records. It was with King Records, however, beginning in 1946, that he came into his own as a recording artist, cutting a decade's worth of superb music, including a uniquely stylized version of "New Jole Blon" that was a hit in 1947, and the ballad "Sweeter Than the Flowers" in 1948. However, it was in the realm of hillbilly boogie that Mullican had his greatest influence, his versions of "Shoot the Moon" and "Don't Ever Take My Picture Down" pre-figuring rock & roll (especially Jerry Lee Lewis's brand of it) in tone and beat, if not youthful subject matter. In particular, the sides that Mullican cut with producer Henry Glover at King crossed over easily into R&B, though he was equally comfortable with pop standards, honky tonk, and traditional country. By the end of the '40s, he was a member of the Grand Ole Opry and found a national audience from its radio broadcasts, which helped propel the sales of his biggest hit, "Cherokee Boogie," in 1951. Mullican was a star in the world of country music, and may have had more influence there than the sales of his records would lead one to believe. For decades, it was an open secret that he'd co-written "Jambalaya (On the Bayou)" with his fellow Grand Ole Opry member Hank Williams, collecting a 50 percent share of the royalties on the sly because of his contractual relationship to King Records. By the mid-'50s, he was trying to get out of King Records, however, and onto one of the major labels. It didn't happen for Mullican until the end of the '50s, a point where his star had fallen considerably. Rock & roll had taken a lot of the edge off the sales of country records, effectively stealing the youngest, most active, and most pliable portion of country's audience. Mullican's record sales, ironically, had fallen even as the stars of such stylistic emulators and successors as Jerry Lee Lewis rose. If Bill Haley, who didn't have half of Mullican's singing ability, seemed over the hill as soon as his balding, pudgy post-30-ish image became well-known, then Mullican, with his cowboy hat, Western twang in his singing, and 50-ish appearance was definitely not what the kids were buying. By the end of the '50s, he'd been released from King but couldn't get another recording deal very easily, as his sales had declined through the middle of the decade. A move to Coral Records led to a toned-down country approach, which managed to intersect with rock & roll, blues, and pop music, but success still eluded him, even when he recut his King Records hits. Mullican entered the '60s as an overlooked figure, apart from country listeners with long memories and those people lucky enough to catch his performances in Texas and around the Southern and border states. A 1962 heart attack on-stage sidelined him into the following year, but he was back performing and recording in 1963, this time locally for the Hall-Way label of Beaumont, TX, where he made his home. He never gave up performing or his love of pleasing an audience. Finally, on New Year's Eve of 1966-1967, he suffered another heart attack, and died early in the morning on January 1, 1967. Two years later, Kapp Records released The Moon Mullican Showcase LP, which included those last sides of his done in Beaumont more than half-a-decade earlier. In the decades since, Mullican's name has gradually become known to a generation of listeners attuned to the roots of rock & roll and pre-Nashville country music, and labels like Ace and Bear Family have issued compilations of his King, Coral, and Hall-Way sides on CD.